The TARDIS[nb 1] (/ˈtɑːdɪs/ (Time and Relative Dimension in Space)[nb 2] is a time machine and spacecraft in the British science fiction television programme Doctor Who and its associated spin-offs. A TARDIS is a product of the advanced technology of the Time Lords, an extraterrestrial civilization to which the programme's central character, the Doctor, belongs. A properly maintained and piloted TARDIS can transport its occupants to any point in time and any place in the universe. The interior of a TARDIS is much larger than its exterior, which can blend in with its surroundings using the ship's "chameleon circuit". In the series, the Doctor pilots an unreliable, obsolete TT Type 40, Mark 3 TARDIS. Its chameleon circuit is faulty, leaving it stuck in the shape of a 1960s-style London police boxafter a visit to London in 1963. The Doctor's TARDIS was for most of the franchise's history said to have been stolen from the Time Lords' home planet, Gallifrey, where it was old, decommissioned and derelict (and, in fact, in a museum). However, during the events of "The Doctor's Wife" (2011), the ship's consciousness briefly inhabits a humanoid body, and she reveals that far from being stolen, she left of her own free will. During this episode, she reveals that she actually considers herself to have "stolen" the Doctor rather than the other way around, although she does also refer to him as her "thief" in the same episode. The unpredictability of the TARDIS's short-range guidance (relative to the size of the Universe) has often been a plot point in the Doctor's travels. Also in "The Doctor's Wife", the TARDIS reveals that much of this "unpredictability" was actually intentional on her part in order to get the Doctor "where [he] needed to go" as opposed to where he "wanted to go". Doctor Who has become so much a part of British popular culture that not only has the shape of the police box become more immediately associated with the TARDIS than with its real-world inspiration, the word "TARDIS" has been used to describe anything that seems to be bigger on the inside than on the outside. The name TARDIS is a registered trademark of the British Broadcasting Corporation. When Doctor Who was being developed in 1963, the production staff discussed what the Doctor's time machine would look like. To keep the design within budget, it was decided to make it resemble a police box. This was explained in the context of the series as a disguise created by the ship's "chameleon circuit", a mechanism which is responsible for changing the outside appearance of the ship in order to fit in with its environment. The Ninth Doctorexplains that if, for example, a TARDIS (with a working chameleon circuit) were to materialise in ancient Rome it might disguise itself as a statue on a plinth. The First Doctorexplained that if it were to land in the middle of the Indian Mutiny, it might take on the appearance of a howdah (the carrier on the back of an elephant). A further premise was that the circuit was broken, explaining why it was "stuck" in that form. The idea for the police-box disguise came from BBC staff writer Anthony Coburn, who rewrote the programme's first episode from a draft by C. E. Webber. Coburn is believed to have conceived the time machine's external form after spotting a real police box while walking near his office on a break from writing the episode. In the first episode, An Unearthly Child, the TARDIS is first seen in a 1963 junkyard. It subsequently malfunctions, retaining the police box shape in a prehistoric landscape. At the time of the series' debut in 1963, the police box was still a common fixture in British cities. It provided a direct telephone link to the local police station; the telephone was located behind a small, hinged door, making it possible to use it from the outside, while the box itself was used as a temporary office containing a desk. In "The Empty Child" (2005), the Doctor stated that the telephone is not connected to a telephone line, and in Logopolis (1981), the Master materialised his TARDIS around a normal police box while a police officer was using the telephone, causing the line to go dead. With approximately 700 (then) in London alone, the police box was a logical choice for the time machine's camouflage. While the idea may have begun as a creative ploy by the BBC to save time and money on props, [nb 4] it soon became an in-joke genre convention in its own right, as the old-style police box was phased out of use. The anachronism has become more pronounced, since there has been only one police box (at Earl's Court) of that style left in Britain for some considerable time. Despite changes in the prop, the TARDIS has become the show's most consistently recognisable visual element. The type of police box that the TARDIS resembled was constructed of concrete. However, the props for the television series were originally made of wood, and later on of fibreglass, for easy transportation and construction on location as well as within the confines of a studio set. The production team conceived of the TARDIS travelling by dematerialising at one point and rematerialising elsewhere, although sometimes in the series it is shown also to be capable of conventional space travel. In the 2006 Christmas special, "The Runaway Bride", the Doctor remarks that for a spaceship, the TARDIS does remarkably little flying. The ability to travel simply by fading into and out of different locations became one of the trademarks of the show, allowing for a great deal of versatility in setting and storytelling without a large expense in special effects. The distinctive accompanying sound effect – a cyclic wheezing, groaning noise – was originally created in the BBC Radiophonic Workshop by Brian Hodgson. He produced the effect by dragging a set of house keys along the strings of an old, gutted piano. The resulting sound was then recorded and electronically processed with echo and reverb. When employed in the series, the sound is synchronised with the flashing light on top of the police box. The comic strip feature of Doctor Who Magazine traditionally represents the ship's distinctive dematerialisation sound with the onomatopoeic phrase "vworp vworp". River Song informs the Doctor in The Time of Angels that it only makes this noise because he leaves the brakes on, and the Doctor defensively responds that he likes the noise. In 1996, the BBC applied to the UK Patent Office to register the TARDIS as a trademark.This was challenged by the Metropolitan Police, who felt that they owned the rights to the police box image. However, the Patent Office found that there was no evidence that the Metropolitan Police – or any other police force – had ever registered the image as a trademark. In addition, the BBC had been selling merchandise based on the image for over three decades without complaint by the police. The Patent Office issued a ruling in favour of the BBC in 2002. Precursor in fictionOne of the earliest time-travel stories, Seeker of To-morrow by Eric Frank Russell and Leslie J. Johnson, features "an air-tight time-travel room" which is described as "looking like a very large telephone kiosk". The story was first published in the July 1937 issue ofAstounding Stories, and the cover of that magazine depicts an object which looks very much like the later TARDIS. TARDISes are bioships that are grown, not made, from a species of coral presumably indigenous to Gallifrey, as shown in "The Impossible Planet," (2006) and it can take years to complete one. They draw their power from several sources, but primarily from the singularityof an artificial black hole, known as the Eye of Harmony. In "The Edge of Destruction" (1964), the power source of the TARDIS (referred to as the "heart of the TARDIS") is said to be beneath the central column of the console. They are also said to draw power from the entire universe as revealed in the episode "Rise of the Cybermen" (2006), in which the TARDIS is brought to a parallel universe and cannot function without the use of a crystal power source from within the TARDIS, charged by the Doctor's life force. Other elements needed for the proper functioning of the TARDIS and requiring occasional replenishment include mercury (used in its fluid links), the rare ore Zeiton 7 ("Vengeance on Varos", 1985), a trachoid time crystal ("The Hand of Fear", 1976) and "artron energy". The latter is a form of temporal energy, generated by Time Lord minds, which is also said to help power TARDISes ("The Deadly Assassin", 1976; "Four to Doomsday", 1982, "The Doctor's Wife", 2011). Another form of energy, "huon energy", is found in the heart of the TARDIS and (apart from the activities of the Torchwood Institute) nowhere else in the universe ("The Runaway Bride"). Before a TARDIS becomes fully functional, it must be primed with the biological imprint of a Time Lord, normally done by simply having a Time Lord operate the TARDIS for the first time. This imprint comes from the Rassilon Imprimatur, part of the biological make-up of Time Lords, which gives them both a symbiotic link to their TARDISes and the ability to withstand the physical stresses of time travel ("The Two Doctors", 1985). Without the Imprimatur, molecular disintegration would result; this serves as a safeguard against misuse of time travel even if the TARDIS technology were copied. Once a time machine is properly primed, however, with the imprint stored on a device called a "briode nebuliser", it can be used safely by any species. [nb 6] According to Time Lord law, unauthorised use of a TARDIS carries "only one penalty", implied to be death ("The Invasion of Time"). A TARDIS usually travels by dematerialising in one spot, traversing the time vortex, and then rematerialising at its destination, without physically travelling through the intervening space. However, the Doctor's TARDIS has been seen to be able to fly through physical space, first in "Fury from the Deep" (1968) and at repeated times throughout the revived series, most notably in "The Runaway Bride" (2006), in which the TARDIS is shown launching into space (most previous incidents show the TARDIS flying only after it has dematerialised from a location). In "The Runaway Bride", extended flight of this nature puts a strain on the TARDIS's systems. While a TARDIS can materialise inside another, if both TARDISes occupy exactly the same space and time, a Time Ram will occur, resulting in their mutual annihilation ("The Time Monster"). In "Logopolis", the Master tricked the Doctor into materialising his TARDIS around the Master's, creating a dimensionally recursive loop, each TARDIS appearing inside the other's console room. In the mini-episodes"Space" and "Time" (2011), an accident results in the TARDIS automatically materializing in "the safest spot available," which turns out to be inside its own control room. The Eleventh Doctor describes this as "worse than a time loop - a space loop. Nothing can enter or leave this ship ever again." However, a version of Amy Pond from seconds in the future appears as soon as he says this, proving the Doctor wrong and allowing him to rectify the problem. Apart from the ability to travel in space and time (and, on occasion, to other dimensions), the most remarkable characteristic of a TARDIS is that its interior is much larger than it appears from the outside. The explanation is that a TARDIS is "dimensionally transcendental", meaning that its exterior and interior exist in separate dimensions. In "The Robots of Death" (1977), the Fourth Doctortried to explain this to his companion Leela, using the analogy of how a larger cube can appear to be able to fit inside a smaller one if the larger cube is farther away, yet immediately accessible at the same time (see Tesseract). According to the Doctor, transdimensional engineering was "a key Time Lord discovery". To those unfamiliar with this aspect of a TARDIS, stepping inside the ship for the first time usually results in a reaction of shocked disbelief as they see the interior dimensions ("It's bigger on the inside!"). Susan Foreman, the Doctor's granddaughter, claimed to have coined the name TARDIS: "I made [it] up from the initials." 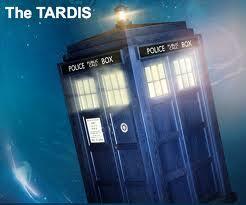 The word TARDIS is used to describe other Time Lords' travel capsules as well. The Discontinuity Guide, written by Paul Cornell, Keith Topping, and Martin Day, suggests that "[she] was a precocious young Time Lady, and her name for travel capsules caught on." The Virgin New Adventures novel Lungbarrow by Marc Platt records Susan telling the First Doctor that she gave him the idea when he was, implicitly, the "Other". However, it should be noted that, on screen in the episode "An Unearthly Child," Susan only takes credit for coining the acronym, not the actual full name itself. As seen in "The Trial of a Time Lord" (1986), the experiences of the TARDIS and its crew can be recorded and played back from the Matrix, the Time Lord computer network that is the repository of all their knowledge, as well as the memories and experiences of deceased Time Lords. The Doctor implies in this serial, with his protestations of being "bugged", that the TARDIS is not normally connected to the Matrix in this manner. The TARDIS has been shown to be incredibly rugged, withstanding gunfire (the 1996 television movie, Doctor Who; "The Runaway Bride"), temperatures of 3000 degrees without even scorching ("Forty-Two"), atmospheric re-entry ("Voyage of the Damned"), falls of several miles ("The Satan Pit") and sinking into pooling acid (The Almost People). In "The Curse of Peladon," after the TARDIS falls down the side of a cliff, the Third Doctor remarks that it "may have its faults, but it is indestructible." This does not apply when facing certain extremely advanced weaponry, often created after the Doctor's Type 40 TARDIS, such as Dalek missiles ("The Parting of the Ways"), for which the TARDIS requires additional shielding. Another piece of advanced Dalek technology which comes near to destroying the TARDIS is the power source of the Crucible in "Journey's End" (2008). In "Frontios" (1984), the Fifth Doctor believes the TARDIS to have been destroyed in a meteorite bombardment, apparently contradicting the earlier claim of indestructibility. It explodes in the Mind Robber and the crew end up "out of the time space dimension. Out of reality." In 2007's Christmas special "Voyage of the Damned", the TARDIS is hit in mid-flight, creating a large hole in the interior wall, although its shields are down at the time. The Doctor later activates some controls and the TARDIS again becomes able to withstand an atmospheric re-entry. The Doctor's TARDISIn the programme, the Doctor's TARDIS is an obsolete "Type 40 TT capsule" that he unofficially "borrowed" when he departed his home planet of Gallifrey. According to the Eighth Doctor Adventures novel The Gallifrey Chronicles by Lance Parkin, it previously belonged to a Time Lord named Marnal, who was, like the Doctor, something of a renegade. By the time of "The Pirate Planet," the Doctor had been travelling onboard in time and space for 523 years and by the time of "The Doctor's Wife", he had been travelling in it for 700 years. There were originally 305 registered Type 40s, but all the others had been decommissioned and replaced by new, improved models.However, the changing appearance of the primary console room over the years and the Second Doctor's statement in 1972's "The Three Doctors" – "Ah! I can see you've been doing the TARDIS up a bit. I don't like it." – suggests that the Doctor does upgrade the TARDIS's systems on occasion. The ship has also shown the ability to rebuild and reconfigure itself. In "The Eleventh Hour" the TARDIS completely changes after crashing, and the Doctor's comment "What have you got for me this time?" implies it is not the first time the TARDIS had undergone repairs of its own doing. In the 2007 Children in Need special "Time Crash" the Fifth Doctor complains to theTenth Doctor that he had "changed the desktop theme!" In "The Doctor's Wife" the TARDIS says she has 30 desktops archived, although the Doctor has only changed it a dozen times "yet". 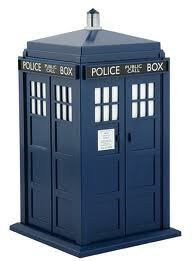 The TARDIS was already old when the Doctor first took it, but its actual age is not specified. The spin-off media have, on a number of occasions, had the TARDIS wait around for the Doctor for decades and even centuries in relative time. In "The Empty Child" (2005), the Ninth Doctor claimed that he has had "900 years of phone box travel", although "The Doctor's Wife" contradicts this by saying they've been travelling together for only 700 years. In the unfinished TV serial "Shada", fellow Time Lord Professor Chronotis said that the Type 40 models came out when he was a boy, which showed how old it was considering that he was on his final incarnation. TARDIS, Time and Relative Dimension in Space, Build Site: Gallifrey Blackhole Shipyard, Type 40 Build Date: 1963, Authorised for use by qualified Time Lords only by the Shadow Proclamation, Misuse or Theft of any TARDIS will result in extreme penalties and possible exile. (It is not possible as yet to confirm whether this is a genuine indicator of the TARDIS' date of manufacture, etc., as it may have been something created by the Doctor, given the label's reference to "possible exile", referring to events that befell the Third Doctor. )The 2011 episode "The Doctor's Wife" the "soul" of the ship is transferred into the body of a humanoid female called Idris, and enabling the Doctor to have a conversation with his craft. The TARDIS says that she deliberately allowed the Doctor to "steal" her, as she wanted to see the universe itself; in a reversal of the traditional view, the TARDIS claims to have stolen the Doctor. When he accuses the TARDIS of being unreliable, she defends herself by saying that she has always taken him where he needed to go, if not where he wanted. At the end of the episode, the TARDIS' soul is returned to the ship's systems. A TARDIS prop being assembled in London in 2006. Although a TARDIS is supposed to blend inconspicuously into whatever environment it turns up in, the Doctor's TARDIS retains the shape of a police box because of a systems fault which occurred in the first Doctor Who episode, "An Unearthly Child," when the TARDIS landed in London in 1963. The ability to alter its appearance was first mentioned in the second episode of the series, where the First Doctor and Susan noted the unit was malfunctioning. It was first given a general term of a "camouflage unit" in "The Time Meddler" (1965). The name "chameleon circuit" was first used in the 1975 Target Books novelisation of "The Terror Of The Autons," and eventually mentioned on screen in "Logopolis" (1981). The circuit was called a "cloaking device" by the Eighth Doctor in the Doctor Who television movie, and again a "chameleon circuit" in the 2005 series episode "Boom Town". The Doctor attempts to repair the circuit in "Logopolis" and "Attack of the Cybermen", but the successful transformation of the TARDIS into the shapes of a pipe organ, a paintedWelsh dresser (much to the amusement of Perpurgilliam "Peri" Brown and the Sixth Doctor's annoyance) and an elaborate gateway in the latter serial was followed by a return to the police box shape. The circuit was also repaired during the Virgin New Adventures novels, but again the TARDIS's shape was eventually set back to a police box shape. In "Boom Town" (2005), the Ninth Doctor implied that he had stopped trying to fix the circuit quite some time ago because he had become rather fond of the police box shape – a claim the Eighth Doctor made in the 1996 television movie. Cosmetically, the police box exterior of the TARDIS has remained virtually unchanged, although there have been slight modifications over the years. For example, the sign on the door concealing the police telephone has been black letters on a white background ("An Unearthly Child"), white on blue ("The Seeds of Death") and white on black ("The Curse of Peladon"). Other modifications include different wordings on the phone panel; for example, "Urgent Calls" ("An Unearthly Child") as opposed to "All Calls" ("Castrovalva" publicity photos). The "POLICE BOX" sign was wider from Season 18 (1980) onwards and for the 2005 series, but not for the television movie. From "An Unearthly Child" (1963) to "The War Machines" (1966), the TARDIS also had a St. John Ambulance badge on the main doors, as did real police boxes; this has been reinstated and the window frame colour has returned to white for Matt Smith's first season as the Doctor, shown in 2010. As the TARDIS does not have a second set of inner doors in the revived series, the interior side of the police box doors – complete with the police telephone mounted on the inside of the cupboard door – are seen from the control room. "The Empty Child" revealed that the cupboard could be opened and the telephone accessed from the exterior, but that this device is non-functional because it is not connected to any telephone lines. In the 1996 television movie, the Eighth Doctor revealed that he hid a secret key in a cubbyhole above the 'P' in the 'POLICE BOX' sign. Despite the anachronistic police box shape, the TARDIS's presence is rarely questioned when it materialises in the present-day United Kingdom. In "Boom Town", the Doctor simply noted that humans do not notice odd things like the TARDIS, echoing a similar sentiment expressed by the Seventh Doctor in Remembrance of the Daleks (1988), that humans have an "amazing capacity for self-deception". Various episodes, notably "The Sound of Drums", also note that the TARDIS generates a perception filter to reinforce the idea that it is perfectly ordinary. Doors and lockFor most of the series run, the exterior doors of the police box operated separately from the heavier interior doors, although sometimes the two sets could open simultaneously to allow the ship's passengers to look directly outside and vice versa. 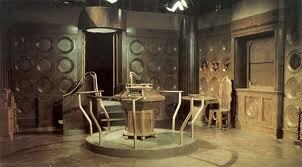 The revived series' TARDIS features no such secondary doors; the police box doors open directly into the console room. The entrance to the TARDIS is capable of being locked and unlocked from the outside with a key, which the Doctor keeps on his person and occasionally gives copies of to his companions. In the 1996 television movie, the Eighth Doctor (and the Seventh before him) kept a spare key "in a cubbyhole behind the 'P'" (of the POLICE BOX sign). In "The Invasion of Time," a Citadel Guard on Gallifrey is initially baffled by the archaic lock when attempting to open the Doctor's TARDIS. Newer TARDIS models apparently have more advanced locking mechanisms that are touch-sensitive or may be operated by remote control. In "The Doctor's Wife," the TARDIS implies that she deliberately unlocked herself so the Doctor could steal her. The Doctor almost always opens the doors inwards, despite the fact that real police boxes open outwards; in "The Doctor's Wife", it is revealed the TARDIS is aware of this and finds it annoying. (Otherwise, however, her opinion of the actual police box appearance is left unrevealed.) After crash-landing on its back in Amelia Pond's garden in "The Eleventh Hour", the doors uncharacteristically open outward; additionally, the left door opened in tandem with the usual right door in that instance. When hovering against a building in the same 'doors-up' horizontal orientation in "Day of the Moon", however, the doors opened inward as usual for the arrival of Amelia's daughter, River Song. In the 2005 series, the keys are also remotely linked to the TARDIS, capable of signalling its presence or impending arrival by heating up and glowing. The TARDIS keys have varied in design from an ordinary Yale key to an ankh-like key embossed with an alien pattern (identified in Terrance Dicks and Malcolm Hulke's 1972 book The Making of Doctor Who as the constellation of Kasterborous, Gallifrey's home system) from seasons 11 to 13, after which it reverted to the Yale key design. The ankh-like key was also used in the 1996 television movie. In "Ghost Light" and "Survival", a different design, featuring the Seal of Rassilon, was used. The revived series uses the Yale key version, most notably shown in "Blink" (2007), when the Weeping Angels attempt to gain access to the TARDIS using a stolen key. The key is also able to repair temporal anomalies and paradoxes, including death aversion through its link to the TARDIS. The TARDIS lock's security level has varied from story to story. Originally, it was said to have 21 different "combinations" and would melt if the key was placed in the wrong one ("The Daleks", 1963). The First Doctor was also able to unlock it with his ring ("The Web Planet", 1965) and repair it by using the light of an alien sun refracted through the ring's jewel ("The Daleks' Master Plan"). In "Utopia" (2007), and in "The Dalek Invasion of Earth" (1964), the TARDIS was shown to have an internal deadlock; once thrown, it would prevent entry even for authorised users with authorised keys. In "The Dalek Invasion of Earth", this was known as 'Double-Locking'. In "The Sensorites" (1964), the entire lock mechanism was removed from the TARDIS door via a hand-held Sensorite device. The changing design of the TARDIS keys also suggests that the Doctor changes the lock system every now and then, and that it does not always work the same way. In "Spearhead from Space" (1970), the Third Doctor said that the lock had a metabolism detector, so that even if an unauthorised person had a key, the doors would remain locked. This security measure was also seen in the New Series Adventures novel Only Human by Gareth Roberts, which called it an "advanced meson recognition system." The Ninth Doctor claimed that when the doors were shut, even "the assembled hordes of Genghis Khan" could not enter ("believe me, they've tried") ("Rose"). In "Doomsday", when the TARDIS is confiscated, the Doctor claims, "You'll never get inside it." Several people have managed to just wander into the TARDIS without any problem over the years, including some who became companions; since the TARDIS uses keys, it could easily have been left unlocked. Despite the TARDIS's apparent infallibility in its security, some of the instruments inside or the interior itself have been breached and remote-controlled. In the serial "The War Games," the Time Lords manage to breach the inside of the TARDIS while in mid-flight and landing in order to erect something similar to a force field. In "Utopia", the Doctor was able to lock the TARDIS to the coordinates it had previously visited from outside using the sonic screwdriver. In the 2008 episode "Forest of the Dead", River Song (a character whose timeline intersects with the Doctor in reverse order) says to the Doctor that she knows he would be able to open the TARDIS doors with a snap of his fingers. Although the Doctor dismisses this as impossible, at the conclusion of the episode, he opens and closes the doors by doing just that, eschewing the need for a key. TheEleventh Doctor also does this at the end of "The Eleventh Hour", when revealing the newly regenerated TARDIS interior to Amy Pond; he then does it again in "Day of the Moon". In the 2011 episode, "The Doctor's Wife", he tries to open it by snapping his fingers, but the door is locked by the mysterious entity, "House". This ability seems to be unique to the Doctor, though, as he said Time Lords cannot do that. The fact that he can is another indication of the TARDIS' affinity to him. In the Christmas 2009 episode "The End of Time, Part One", the Doctor uses a remote locking system to lock the TARDIS, similar to the remote-control locking system used on modern cars. Upon pointing his key fob at the TARDIS, the TARDIS makes a distinctive chirp and the light on top of the TARDIS flashes. Later in the same episode, the key fob, when again used by the Doctor, shifts the TARDIS "just a second out of sync" (one second into the future), rendering it invisible and so hiding it from the Master. The doors are supposed to be closed while materialising; in "Planet of Giants" (1964), the opening of the doors during a materialisation sequence caused the ship and its occupants to shrink to doll size. In "The Enemy of the World" (1967), taking off while the doors were still open resulted in rapid decompression, with the villainous Salamander being sucked out of the TARDIS. The Second Doctor and his companions managed to cling to the console, and the crisis passed when Jamie McCrimmon managed to shut the doors. In "Warriors' Gate" (1981), the doors open during flight between two universes, admitting a Tharil named Biroc, and allowing the time winds to burn the Doctor's hand and seriously damage K-9. In "The Runaway Bride" (December 2006), "The Stolen Earth" (2008), and "The Beast Below (2010)", however, the doors can be opened safely while the ship is in vacuum, as the TARDIS protects its occupants (see the "Defences" section below). There is evidence that objects clinging to the outside of the TARDIS may be carried with it as it dematerialises. In "Silver Nemesis" (1988), an arrow is fired at the TARDIS and is embedded in its door. The arrow remains in the door throughout the serial and through several dematerialisations before being removed at the story's conclusion; this is repeated in "The Shakespeare Code" (2007), and the arrow is removed in the following episode. "Utopia" presented, for the first time on-screen, a circumstance in which a character travels on the exterior of the TARDIS during a flight, when Jack Harkness was somehow able to grab hold of the TARDIS as it began to dematerialise and hold on to its destination; the episode does establish, however, that a normal person would not have survived the trip, as Harkness is "killed" by the experience, but due to his immortality, soon revives. In "Vincent and the Doctor" (2010), some advertisements are attached to the TARDIS. After materialisation, they are shown to be burning. In the Seventh Doctor audio drama "Colditz," a character was killed by being halfway inside the TARDIS when it dematerialised. As per-usual for Doctor Who, the canonicity of non-television stories is unclear. Exterior influenceThe Time Lords are able to divert the TARDIS's flight path ("The Ribos Operation" (1978)), or have the ability to totally override and recall any TARDIS by the order of the Council ("Arc of Infinity" (1983)). Alien influences have also, for example, trapped the Doctor's TARDIS and drained its power in "The Web Planet" (1965) and "Death to the Daleks" (1974), while its course has been diverted by "The Keeper of Traken" (1981), the "Mandragora Helix" (1976) and by the Daleks' "time corridor" in "Resurrection of the Daleks" (1984). In "The Mark of the Rani" (1985), the Rani used a Stattenheim remote control to summon her TARDIS. In "The Two Doctors" (1985), the Second Doctor also used a portable Stattenheim. The Doctor used his sonic screwdriver to trigger remotely "Emergency Programme One", sending his human companion Rose Tyler to safety, while he stayed behind for a battle against the Daleks ("The Parting of the Ways" (2005)). The Doctor also manipulated the TARDIS by utilising the self-attracting nature of huon particles, causing the TARDIS to materialise around both Donna Noble and himself, in order to escape into the past. However, this trick was used in turn by the Empress of the Racnoss, which pulled the TARDIS from the creation of the Earth to only a few minutes after its initial departure. The exterior dimensions can be severed from the interior dimensions under extraordinary circumstances. In "Frontios" (1984), when the TARDIS was destroyed in a Tractator-induced meteor storm, the interior ended up outside the police box shell with various bits embedded in the surrounding rock. The Doctor eventually tricked the Gravis, leader of the Tractators, into reassembling the ship. In "Father's Day" (2005), a temporal paradox resulting in a wound in time threw the interior of the ship out of the wound, leaving the TARDIS an empty shell of a police box. The Doctor attempted to use the TARDIS key in conjunction with a small electrical charge to recover the ship, but the process was interrupted and the TARDIS was only restored after the paradox was resolved. In "Turn Left" (2008), the "Police Box" sign and all other text on the TARDIS is shown as replaced with the words "Bad Wolf", as is all text in the universe; this is interpreted by the Doctor as an urgent warning concerning the end of the universe. The words "Bad Wolf" have also been spray-painted on and around the TARDIS in previous episodes. The TARDIS has the ability to turn invisible, allowing it to avoid the detection by President Nixon, Canton Everett Delaware III and Area 51 operatives ("The Impossible Astronaut", "Day of the Moon" (2011)). The TARDIS interior has a vast number of rooms and corridors. The exact dimensions of the interior have not been specified, but apart from living quarters, the interior includes an ancillary power station disguised as an art gallery, a well-organised study (TARDIS, 2010), a greenhouse, bathroom, a library, a swimming pool, a medical bay, several squash courts, and several brick-walled storage areas ("The Invasion of Time" (1978)). There is also a secondary control room with ornate wood panels. Old (and future) control rooms can be "archived" by the TARDIS without the Doctor's knowledge, as seen in "The Doctor's Wife." Portions of the TARDIS can also be isolated or reconfigured; the Doctor was able to jettison 25% of the TARDIS's structure in "Castrovalva" to provide additional "thrust". In "The Doctor's Wife," this process is referred to as "deleting" rooms and is used to enable travel between universes. A fail-safe prevents living creatures from being "deleted" when the room is; they are instead transferred to the main control room. Rooms within the TARDIS can be re-arranged to suit the Doctor's needs, as when the Eleventh Doctor hastily moved the swimming pool beneath the TARDIS entrance in order to catch River Song in "Day of the Moon." Despite a widespread assumption that the interior of the TARDIS is infinite, there are indications that it is not. In "Full Circle" (1980),Romana stated that the weight of the TARDIS was 5 × 106 kilograms in Alzarius's Earth-like gravity (about 5 × 107 Newtons, or the weight of 5,000 tonnes). It has been speculated that this was a mistake by the character and referred to its internal weight, as the external part of the TARDIS is at other times light enough for it to be lifted or otherwise moved with relative ease (although most real police boxes were concrete and hence quite difficult to move): several men lift it up in "Marco Polo," it requires a fork-lift truck in "Time-Flight," a group of small blue maintenance workers on Platform One push it along the ground in "The End of the World", and a quartet ofWeeping Angels are able to rock it back and forth in "Blink", to name a few. The TARDIS floats in "Fury from the Deep." If the solid exterior of the TARDIS is moved or shaken after materialisation, the movement is usually transmitted to its interior, although there is a manual control to separate the internal gravity from the exterior's orientation ("Time-Flight," 1982). In the tie-in novels, the interior of the TARDIS has been known to contain an entire city (Cat's Cradle: Time's Crucible), used to encompass an entire parallel Earth (Blood Heat), and is big enough to dwarf Gallifrey itself when turned inside out (The Ancestor Cell). It is also seen to exist in multiple timelines. A distinctive architectural feature of the TARDIS interior is the "roundel". In the context of the TARDIS, a roundel is a circular decoration that adorns the walls of the rooms and corridors of the TARDIS, including the console room. Some roundels conceal TARDIS circuitry and devices, as seen in the serials "The Wheel in Space" (1968), "Logopolis", "Castrovalva" (1981), "Arc of Infinity" (1983), "Terminus" (1983), and "Attack of the Cybermen" (1985). The design of the roundels has varied throughout the show's history, from a basic circular cut-out with black background to a photographic image printed on wall board, to translucent illuminated discs in later serials. In the secondary console room, most of the roundels were executed in recessed wood panelling, with a few decorative ones in what appeared to be stained glass. In the TARDIS design from 2005 – January 2010, the roundels are built into hexagonal recesses in the walls. After the TARDIS was regenerated at the beginning of the 2010 series, there are a range of different roundel designs around the control room. These include circular holes that are recessed deep into the walls, hexagonal holes that are lit from behind each face, round indents with brass rings around the outside, and a glass centre that is illuminated blue. Other rooms seen include living quarters for many of the Doctor's companions, although the Doctor's own bedroom has never been seen. The TARDIS also had a "Zero Room", a chamber that was shielded from the rest of the universe and provided a restful environment for the Fifth Doctor to recover from his regeneration in "Castrovalva" (which was among the 25% jettisoned). However, theSeventh Doctor spin-off novel Deceit indicated that the Doctor rebuilt the Zero Room shortly before the events of that novel. In some of the First Doctor serials, a nearby room contains a machine that dispenses food or nutrition bars to the Doctor and his companions. This machine disappears after the first few serials, although mention is occasionally made of the TARDIS kitchen. In "The One Doctor," Mel mentions that the Doctor used the TARDIS's laundromat. Although the interior corridors were not initially seen in the 2005 series, the fact that they still exist was established in "The Unquiet Dead", when the Doctor gives Rose some very complicated directions to the TARDIS wardrobe. The wardrobe is mentioned several times in the original series and spin-off fiction, and seen in "The Androids of Tara" (1978), "The Twin Dilemma" (1984) and "Time and the Rani" (1987). The redesigned version, from which the Tenth Doctor chooses his new clothes, was seen in "The Christmas Invasion" (2005) as a large multi-levelled room with a helical staircase. Designer Ed Thomas has suggested that more rooms may be seen in coming episodes. The corridors were eventually seen in the episode "The Doctor's Wife," and are currently standing sets for use in future episodes. The Doctor also mentions in "The Shakespeare Code" that the TARDIS has an attic. In The Eleventh Hour, the Doctor mentions that the TARDIS has a library and a swimming pool. He tells Captain Avery that there are several bathrooms available in "The Curse of the Black Spot" (2011). The swimming pool has been seen on-screen in "The Invasion of Time" (1978), and the Doctor later used it to catch River Song as she plummeted from a skyscraper. The swimming pool, the scullery, squash court 7, the archived Ninth and Tenth Doctor's console room, and Amy and Rory's quarters were ejected in the episode "The Doctor's Wife." The Doctor reconstructed Amy and Rory's bedroom but replaced the bunk beds with a normal bed at their insistence. 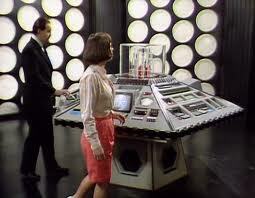 The most often-seen room of the TARDIS is its console room, where its flight controls are housed. The console room was designed by Peter Brachacki and was the only set he designed for the show. It was built on a shoestring budget and a tight schedule, which led to Brachacki leaving the show due to disagreements with the production team and possibly a feeling that he had been given an impossible task. 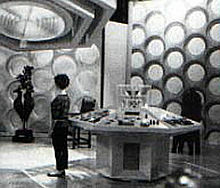 Despite his leaving the show and mixed reactions as to how the set looked (producer Verity Lambert liked it but director Waris Hussein did not), the basic design of the hexagonal console and wall roundels has persisted to the present day. The TARDIS has at least two console rooms: the primary, white-walled, futuristic one most used throughout the programme's history; and the secondary console room used duringSeason 14 in 1976/77, which has wood panelling and a more antique feel to it. The cavernous, steampunk-inspired console room of the television movie may have been a reconfiguration of either of the previously mentioned console rooms (as first suggested in New Adventures novels and later in the Big Finish Productions audio plays), a different desktop, or an additional console room. In the Third Doctor serial "The Time Monster" (1972), the console room of the TARDIS was dramatically altered, including the wall roundels. This new set, designed by Tim Gleeson, was disliked by producer Barry Letts, who felt that the new roundels resembled washing-up bowls stuck to the wall. As it turned out, the set was damaged in storage between production blocks and had to be rebuilt, so this particular design only saw service in the one serial. 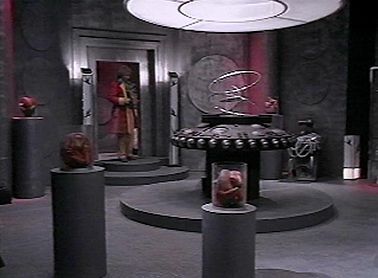 In the 2005 series, the console room became a dome-shaped chamber with organic-looking support columns, and the interior doors were removed. The change in configuration is explained in "Time Crash" by the Fifth Doctor as a mere changing of "the desktop theme" to "Coral" (he also indicates that a "Leopard Skin" theme is also available, but he dislikes it). 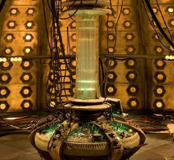 Other preceding theories involve the fact that the TARDIS interior was severely damaged by a cold fusion explosion in The Gallifrey Chronicles. Several episodes of the revived series, such as "Army of Ghosts" and the end of "The Unicorn and the Wasp", reveal that there is a storeroom of some sort directly underneath the console room, as the Doctor is shown periodically obtaining equipment from this area, accessing it via a panel in the floor. The 2005 console room was destroyed by the regeneration energy of the Tenth Doctor in the final scene of "The End of Time," although it made a reappearance in the 2011 episode "The Doctor's Wife". A new console room, along with a new police box exterior, made its debut in the Eleventh Doctor's first episode, which aired on 3 April 2010. It was revealed in "The Doctor's Wife" that the older TARDIS interior designs are not destroyed or remodelled, but 'archived' off the official schematic without the Doctor's knowledge. 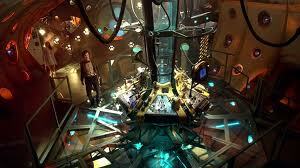 The TARDIS reveals that she has around 30 console rooms archived, even those that the Doctor has yet to use. These archived console rooms are still capable of controlling TARDIS functions as shown when Amy and Rory are able to lower the TARDIS shields from an archived control room. The Virgin novels introduced a tertiary console room, which was described as resembling a Gothic cathedral (Nightshade by Mark Gatiss). Another novel (Death and Diplomacy by Dave Stone) suggested that the "native" configuration is so complex and irrational that most non-Time Lords who witness it are driven mad from the experience. The "active" console room at a given time will be the one "connected" to the exterior doors for ingress and egress. It also appears that the active console room is always within a reasonable distance of the most-used interior rooms such as the bedrooms, wardrobe and sickbay. Throughout the programme's history there have been various attempts at humanising the console room by adding various accoutrements. For example, a hatstand has often been located somewhere in the room, and the first episodes featured an ormoluclock. In "The Androids of Tara" (1978) a cupboard containing fishing gear is shown nearby. Most recently, in "The Rebel Flesh" (2011), a dartboard is seen installed in the console room, and it is revealed that the console is capable of playing recorded music. TARDIS consoleThe main feature of the console rooms, in any of the known configurations, is the TARDIS console that holds the instruments that control the ship's functions. The appearance of the primary TARDIS consoles has varied widely but shares common details: hexagonal pedestals with controls around the periphery, and a moveable column (or time rotor as it has been called in the original series and the 2011 episode "The Doctor's Wife") in the centre that bobs rhythmically up and down when the TARDIS is in flight, like a pump or a piston. The arrangement of the controls implies that the console was designed to be manned by more than one person. One piece of fan continuity, used in the spin-off media, and also mentioned by the current production team, is that the intended number of operators is somewhere between three and six. In "Journey's End", the Doctor confirms that the intended number is six; Rose Tyler, Martha Jones,Sarah Jane Smith, Mickey Smith, Jack Harkness and the Doctor man the controls, and the TARDIS runs far more smoothly during that brief period than it normally does. This also explains why the Doctor tends to do a lot of manic running around the console while he is piloting the TARDIS, as well as the occasional difficulty he has in controlling it, although Romana, the Doctor's one-time Time Lord companion, is able to pilot the TARDIS successfully by herself. Professor River Song was also shown to pilot the TARDIS smoothly and easily without help. 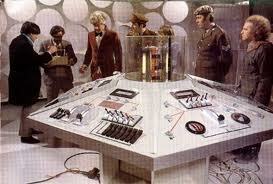 The console can be operated independently of the TARDIS. During the Third Doctor's era, he occasionally detaches the console from the TARDIS to perform repairs on it. In "Inferno" (1970) the Doctor accidentally rides a detached console into a parallel universe. The central column is often referred to as the "time rotor", although when the term was first used in "The Chase" (1965) it referred to a different instrument on the TARDIS console. However, the use of this term to describe the central column was common in fan literature, and was finally used on screen to refer to the central column in "Arc of Infinity" (1983) and "Terminus" (1983). The current production team uses the term in the same way. It was also referred to as the "time column" in "Logopolis" (1981). The secondary console was smaller, with the controls hidden behind wooden panels, and had no central column. The 1996 television movie console also appeared to be made of wood and the central column connected to the ceiling of the console room. The new series' console is circular in shape and divided into six segments, with both the control panels and the central column glowing green, the latter once again connected to the ceiling. The 2005 console has a much more thrown-together appearance than previous consoles, with bits of junk from various eras substituting as makeshift controls, including a glass paperweight, a locomotive style water sight glass and protector, a small bell, and a bicycle pump, the latter identified in the Tenth Doctor interactive mini-episode "Attack of the Graske" as the vortex loop control. Three other controls—the dimensional stabiliser, vector tracker, and the handbrake—were also identified, but although the stabiliser had been mentioned before in the series, the canonicity of the mini-episode is also unclear. As seen in "World War Three," there is also a working telephone attached to the console. In the 2010 series, the new console includes items such as a washer-fluid bottle from a car and a typewriter keyboard. Precisely how much control the Doctor has in directing the TARDIS has varied over the course of the series. The First Doctor did not initially seem to be able to steer it accurately, making only one intended landing to the planet Kembel in "The Daleks' Master Plan" (1965–6) by using the directional unit taken from another TARDIS before the unit burns out. During the Third Doctor's exile on Earth, the TARDIS's course is shown as controlled successfully by the Time Lords, and from the point the Time Lords unblock his memory of time-travel mechanics in "The Three Doctors" (1972–3), the Doctor seems able to navigate correctly when needed. Over time the Doctor seemed to be able to pilot the TARDIS with more precision. In "The Seeds of Death," the Second Doctor explains to Zoe Heriot that it would be impossible to use the TARDIS to fly from Earth to the Moon because it would likely "overshoot by a few million years, or a few million miles." However, in "Logopolis," the Fourth Doctor is able to make a "short hop" to the exact coordinates when he initially lands the TARDIS 1.6 metres off target. The Tenth Doctor also turned the TARDIS 90 degrees after landing with the doors against a wall in "Fear Her" (2006). However, writers continue to use the plot device of having the TARDIS randomly land somewhere, or imply that the TARDIS is "temperamental" in its courses through time and space. In "The Shakespeare Code" (2007) the Doctor confessed he failed a test to "fly" the TARDIS. The Tenth Doctor managed to pilot the TARDIS with such precision in "The Lazarus Experiment" (2007) as to have it land inside Martha's bedroom the morning after he had originally picked her up. Such is the Doctor's skill that he was even able to remotely use a robot to access the TARDIS from a distance, set the controls, and have it travel from one part of Mars to the portion of the nearby base in which he and the surviving members of the crew were trapped in "The Waters of Mars" (2009). In "The Runaway Bride" the Doctor is able to pilot the TARDIS sufficiently accurately to fly it down a road alongside Donna's taxi in order to rescue her. Following the Key to Time season (1978–79), the Doctor installed a randomiser to the console which prevented the Doctor (and by extension the evil and powerful Black Guardian) from knowing where the TARDIS would land next. This device was eventually removed in "The Leisure Hive" (1980). In the 2005 and later series, the Doctor is shown piloting the TARDIS at will, although he still makes the occasional error, such as missing his intended mark by a century (1879 instead of 1979) in "Tooth and Claw" (2006), making the mistake of 12 months instead of 12 hours in "Aliens of London" (2005), or getting the correct time but landing on the wrong continent (London instead of New York) in "The Idiot's Lantern" (2006). He can also choose to "set the controls to random" as in "Planet of the Ood" (2008). Again, in "The Eleventh Hour" The Doctor is shown as unable to control the exact time he arrives at, first promising a young Amelia that he would be gone for only five minutes, but taking 12 years to return, and again when he intended to leave Amy for a short while to give the newly regenerated TARDIS a brief shakedown cruise, and ends up returning another two years in the future. However, this may have had to do with the fact that the TARDIS had just repaired itself. In "The Doctor's Wife" the reason why the Doctor seems to lack control over the TARDIS at times is explained: the TARDIS' soul, in the body of a humanoid named Idris, explained that while the TARDIS may not always take the Doctor where he wants to go, it always DOES take him where he needs to go. In "Boom Town", a portion of the TARDIS console opens to reveal a luminescent vapour within, described by the Doctor as the "heart of the TARDIS", harking back to the description in "The Edge of Destruction." In "The Parting of the Ways" (2005) it was shown that this is connected to the powerful energies of the time vortex. The 1996 television movie was the first appearance of the central column being attached to the ceiling. 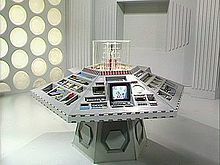 However, a new design for the TARDIS console room was conceived after season 26, which featured the console being suspended from the ceiling via the central column; this design was never built, because the show was cancelled before a 27th season was produced; however, the set was used in a Doctor Who night presented by Sylvester McCoy, where a miniature was built and McCoy was superimposed into it. 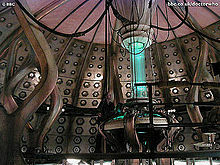 The console room from 2005–2010, first seen in "Rose" and last seen in "The Doctor's Wife". ControlsThe TARDIS possesses telepathic circuits, although the Doctor prefers to pilot it manually. InPyramids of Mars (1975), the Fourth Doctor told Sutekh that the TARDIS controls were "isomorphic", meaning only the Doctor could operate them. However, this characteristic seems to appear and disappear when dramatically convenient, and various companions have been seen to be able to operate the TARDIS and even fly it. In "Blink", the TARDIS was 'pre-programmed' to travel to a specific time (1969) and place by inserting a DVD into the console. The DVD was one of the 17 owned by Sally Sparrow on which the Doctor appeared as an 'Easter egg'. In this situation, however, the TARDIS dematerialised without transporting its occupants. Despite the changes in the layout of the console controls, the Doctor seems to have no difficulty in operating the ship. In "Time Crash", the Fifth Doctor was able to fly the TARDIS even though the console was radically different from the one he was used to, at first without even noticing that the machine had changed. In the episode "Utopia" the TARDIS was taken by the Master and the Doctor was only able to use his sonic screwdriver to restrict the destination times to the last two previous selected destinations. It has been theorised that either the Doctor was lying to Sutekh or the isomorphic feature is a security feature that the Doctor can activate and deactivate when convenient. The Eighth Doctor does just this in the Big Finish Productions audio play Other Lives (2005) to allow his companion C'rizz to operate the console. In "Utopia", the Master has little trouble stealing the Doctor's TARDIS, which is most likely due to him being a Time Lord, although the Doctor "fuses the coordinates" of the TARDIS so that it can only travel between its two most recent journeys – the year 100 Trillion on Malcassairo, and England in the 21st century (with about eighteen months' leeway due to the TARDIS's unpredictable nature). Apart from the sound that accompanies dematerialisation, in The Web of Fear (1968), the TARDIS console was also seen to have a light that winked on and off during landing, although the more usual indicator of flight is the movement of the central column. 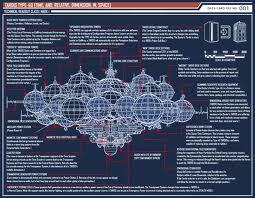 The TARDIS also possesses a scanner so that its crew may examine the exterior environment before exiting the ship. In the 2005 series the scanner display is attached to the console and is able to display television signals as well as various computing functions and occasionally what the production team has stated are Gallifreyan numbers and text. The 2005 series also sees the addition of the tribophysical waveform macro kinetic extrapolator to the TARDIS in the episode "Boom Town". This control was originally a pan-dimensional 'surf board' taken from the Slitheen. In the 2005 episode "The Parting of the Ways", Captain Jack Harkness uses it to rig up a force field that defends the ship from Dalek missiles. The Doctor uses it again in the Christmas 2006 episode "The Runaway Bride", to jar it a few hundred metres off course when being dragged back to the Empress of Racnoss, in a similar manoeuvre to one he used in The Web of Fear with another extra device he plugged into the console. In the last appearance, the TARDIS coral has begun to grow over the extrapolator. In the television movie, access to the Eye of Harmony is controlled by means of a device that requires a human eye to open. Why the Doctor would program such a requirement is retroactively explained in the Big Finish Productions audio play The Apocalypse Element, where a Dalek invasion of Gallifrey prompts the Time Lords to code their security locks to the retinal patterns of the Sixth Doctor's companion Evelyn Smythe. The TARDIS came with an instruction manual that the Sixth Doctor claims to have started reading but never finished. (Vengeance on Varos) Tegan Jovanka could not make sense of its contents, and Peri Brown later found it propping open a vent. The usual function of the manual is to hold up a short leg on the Doctor's hat rack, though "Amy's Choice" featured the Doctor revealing he'd thrown it into a supernova, ostensibly because he disagreed with it. Despite its complexity, some companions with exceptional intelligence, such asNyssa, or familiarity with technology, such as Turlough and Jack Harkness, have been depicted as assisting the Doctor with TARDIS operations. In "The Sontaran Stratagem", Donna Noble displayed an aptitude for piloting the TARDIS under the Doctor's guidance, much to the Doctor's apparent surprise. In "Journey's End", the TARDIS is shown to ideally require six pilots positioned at various stations around the central console to be piloted properly. On that occasion, the six pilots were Rose Tyler, Martha Jones, Sarah Jane Smith, Mickey Smith, Jack Harkness and the Doctor. However, the ending of the 2011 episode "The Doctor's Wife" reveals the TARDIS is actually capable of manipulating the controls herself. In "The Time of Angels", River Song reveals that the TARDIS has a "stabilisation" and "brake" option. The "stabilisation" keeps the TARDIS from moving violently in flight and the "brake", when left on, is the cause of the (de)materialisation noise. However, other TARDISes have made the same sound when dematerialising and materialising, and the consciousness of the Doctor's TARDIS, when briefly transposed into the body of a humanoid woman in the episode "The Doctor's Wife", makes the sound in order to identify herself to the Doctor (the episode also uses the sound effect when the TARDIS consciousness is first inserted into the woman, and later when it departs her body). DefencesIf required, the TARDIS can become temporarily invisible, but this is a significant power drain, as in "The Impossible Astronaut", when the Doctor lands in the middle of the Oval Office at the White House. Despite its outside appearance, the TARDIS seems to be virtually impenetrable. Once, when being chased by a monster, the Doctor reassured his would-be companion, Rose Tyler, that "the assembled hordes of Genghis Khan couldn't break through those doors, and believe me, they've tried." When fully active, the TARDIS's outer defences are (nearly) impenetrable, though in Journey's End the Tenth Doctor says of the Dalek Empire "they're experts at fighting Tardises, they can do anything, right now that wooden door is only wood." This is demonstrated in the last episode of "The Armageddon Factor". In this episode, the Black Guardian is unable to enter the TARDIS after the Doctor activates "...all of the TARDIS's defences..." Clearly, the TARDIS has multiple defences that are capable of preventing one of the most powerful cosmic beings in the universe from entering it. The result is that the Black Guardian is unable to obtain the much-desired Key to Time. 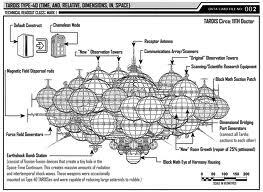 Some of the TARDIS's other functions include a force field and the Hostile Action Displacement System (HADS), which can teleport the ship away if it is attacked (The Krotons, 1968). The force field is still on the TARDIS, as seen in The Runaway Bride, when the Tenth Doctor and the Bride, Donna Noble, are trying to escape the Empress of the Racnoss. In Journey's End, the Doctor states that the Daleks created and led by Davros would have no problem breaching the TARDIS defences. Another device, a tribophysical waveform macro kinetic extrapolator, is installed to generate a force field in the episode "Boom Town" and to protect the ship from Dalek missiles in "The Parting of the Ways". The TARDIS's Cloister Bell is a signal used in the event of "wild catastrophes and sudden calls to man the battle stations" ("Logopolis"). The interior of the TARDIS was once in a state of "temporal grace" ("The Hand of Fear", 1976). The Fourth Doctor explains that, in a sense, things do not exist while inside the TARDIS. This had the practical effect of ensuring that no weapons can be used inside its environs. Unfortunately for the Doctor and his companions, the system that ensured the TARDIS' "temporal grace" ceased working some years ago. Since then weapons have been fired in the console room in "Attack of the Cybermen", "Earthshock" (1982), "The Parting of the Ways" and "Last of the Time Lords", among others. When confronted by Nyssa on this contradiction in "Arc of Infinity", the Doctor responded, "Yes, well, nobody's perfect." In "The Invasion of Time", a guard's patrol staser will not function, even though K9's nose laser does. The Doctor explains on this occasion that the staser will not work within a relative dimensional stabiliser's field (such as that found in the TARDIS), perhaps explaining the inconsistent nature of weapon usage within the ship. In the audio story Human Resources, when a character mentions the temporal grace function, the Eighth Doctor says that his TARDIS "hasn't done that in years". In "Let's Kill Hitler" the Doctor tells the "Mels" incarnation of River Song about the temporal grace system and she shoots something in the TARDIS as a result, causing it to crash. The Doctor then admits that temporal grace is actually just a "clever lie." The TARDIS also has another shield which keeps it from interacting with other objects in the time vortex, namely other TARDISes. When the Doctor forgets to restore these shields after the events of "Last of the Time Lords", he ends up merging his TARDIS with that of his fifth incarnation in the mini-episode "Time Crash". After successfully separating the two, the bow of the alien spaceship calledTitanic, designed to look like the ship of the same name, smashes through the inside wall of the TARDIS before he can raise it again. The damage is repaired, however, when the Doctor reverses time, pulling the Titanic back so the breach never occurred.Despite the shield being designed to keep the TARDIS from interacting with itself, its own interior is considered the safest place, and the ship will thus effect an emergency materialisation within itself under certain circumstances. This occurred in the mini-episodes "Space" and "Time", when Rory Williams' accidental dropping of a thermal coupling prompts the TARDIS' exterior to materialise within its own interior, thereby trapping the ship and its occupants in an endless loop. In "The Doctor's Wife", the Doctor`s makeshift TARDIS materializes within the Doctor`s own TARDIS, but only after Idris telepathically instructs the Doctor's companions, trapped aboard by the House entity, to deactivate the TARDIS's defences from an "archived" control room. 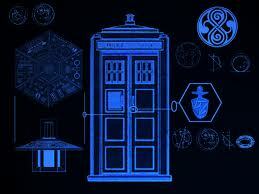 ProgrammingThe TARDIS can be programmed to execute automatic functions based on certain conditions. It was programmed to return to the Doctor upon the insertion of one of Sally Sparrow's DVDs in "Blink". "Emergency Program One" will send Donna Noble back to her own time period if she is left alone in the TARDIS for more than five hours, and will send a signal to his sonic screwdriver. Originally, theNinth Doctor used Emergency Program One to send Rose home in "The Parting of the Ways", although he triggered the program manually by using his sonic screwdriver. In "Voyage of the Damned", the TARDIS will lock on to the nearest planetary body to land there when it becomes adrift in space. The TARDIS automatically repairs after too much damage, as seen in "Voyage of the Damned" when it repairs itself after the spaceship Titanic crashes through its walls. Other systemsThe TARDIS also grants its passengers the ability to understand and speak other languages. This was previously described in The Masque of Mandragora (1976) as a "Time Lord gift [I allow you to share]" which the Doctor shared with his companions, but was ultimately attributed to the TARDIS's telepathic field in "The End of the World" (2005). In "The Christmas Invasion", it was revealed that the Doctor himself is an integral element of this capability. Rose is unable to understand the alien Sycorax whilst the Doctor is in a regenerative crisis. In "The Impossible Planet" (2006), it is said that the TARDIS normally even translates writing; in that episode, the TARDIS is unable to translate an alien script, which the Doctor claims makes the language "impossibly old". However, the TARDIS does not translate Gallifreyan, as seen in "Utopia", when the Doctor was reading Gallifreyan numbers from the console monitor to tell where the TARDIS was going, and again in "A Good Man Goes to War", in which the Gallifreyan script on the Doctor's crib remains unintelligible to the audience and the Ponds. River Song also explains in "A Good Man Goes to War" that the TARDIS' translation matrix can take "a while to kick in" for the written word, actually coming into effect after the departure of the Doctor and the TARDIS. In the Ninth Doctor Adventures novel Only Human, the telepathic field includes a filter that replaces foul or undesirable language with more acceptable terms. In "The Fires of Pompeii", it is shown that if a TARDIS traveller uses words which are foreign to their own language, the translation circuit renders these words appropriately as foreign to the listener's ear (for example, if an English-speaking TARDIS traveller speaks Latin to an ancient Roman, the Roman hears that Latin as "Celtic" or Welsh). It also affects the translation of accents: in Vincent and the Doctor, a translated Scottish accent is heard by a Dutchman and understood as a Dutch accent (though that accent-translation was also an outside reference to the speaker and hearer both being played by actors whose native accent was Scottish). The Translation Circuit does not always function, even for the Doctor. In Four to Doomsday, the Doctor is unable to understand theAboriginal dialect spoken by a tribesman and the Doctor's companion Tegan. Similarly, Martha Jones is initially unable to understand the Hath in the episode The Doctor's Daughter. It is somewhat unclear if her later understanding is based on the translation circuits kicking in, or on her ability to read non-verbal cues, since the audience is never allowed to understand what the Hath are saying. The TARDIS is able to tow other objects (a neutron star in the "The Creature from the Pit, 1979; a ship in "The Satan Pit", 2006); or follow a ship or a transmission through space and time ("The Empty Child", 2005; and "The Stolen Earth", 2008). In "Journey's End", the TARDIS (assisted by the Rift Manipulator situated at Torchwood Three in Cardiff and the supercomputer Mr Smith) is able to tow the Earth across space. At times the TARDIS is shown to have a mind of its own. It is heavily implied in the television series that the TARDIS is "alive" and intelligent to a degree (first in The Edge of Destruction), and shares a bond with those who travel in it; in the television movie, the Doctor calls the TARDIS "sentimental". In "The Parting of the Ways", the Doctor leaves a message for Rose when he believes he will never return, asking her to let the TARDIS die. In the same episode, Rose claims that the TARDIS is alive, echoing the Doctor's earlier statement in "Boom Town". The Doctor's TARDIS is also explicitly said to have died in the episode "Rise of the Cybermen", though the Doctor is able to revive it by giving up some of his life energy (reducing his life expectancy by a decade in the process). Other abilities the TARDIS displays include creating snow via "atmospheric excitation" ("The Runaway Bride") and, through a "chameleon arch", engineering an almost witness protection-style relocation by making its Time Lord another species and placing him/her in a newly fabricated identity with new memories somewhere else in space and time ("Human Nature", "The Family of Blood", "Utopia"). In The Doctor's Wife, the TARDIS's intelligence is temporarily transferred to a humanoid body, during which time it is shown to possess a degree of precognition as well as limited telepathic abilities and a genuine fondness for the Doctor and his companions. This episode also demonstrates that certain capabilities of the physical TARDIS are operable independently of its intelligence, in particular the physical TARDIS's internal password security system (which is language-independent, relying on meanings rather than the words themselves) and ability to travel between "bubble universes". In the novels, a portion of the TARDIS could be separated and used for independent travel. This was featured in two Virgin novels,Iceberg by Davis Banks and Sanctuary by David A. McIntee. This subset of the TARDIS, resembling a small pagoda fashioned out ofjade, had limited range and functionality, but was used occasionally when the main TARDIS was incapacitated. The sentient characteristics of the TARDIS have been made more explicit in the spin-off novels and audio plays. In the Big Finish audio play Omega, the Doctor meets a TARDIS which "dies" after its Time Lord master's demise. Other TARDISes have appeared in the television series. The first was that of the Meddling Monk, another Time Lord, in the 1965 serial The Time Meddler. The Master had at least two TARDISes of his own, each a more advanced model than the Doctor's. The chameleon circuits on these were fully functional, and his TARDISes have been seen in various forms, including a fully functional spacecraft, a Concorde aircraft, a grandfather clock, a fireplace, aDoric pillar, a lorry, a statue (able to move and walk around), a laurel tree, and an iron maiden. In the reconstructed Shada, the Time Lord known as Professor Chronotis has a TARDIS disguised as his quarters at Cambridge University. Another renegade Time Lord, The Rani, appears with her TARDIS. In The Armageddon Factor, the Time Lord Drax has a TARDIS, but it is in need of repair. The War Chief provided dimensionally transcendent time machines named SIDRATs to the alien race known as the "War Lords". In the script for The Chase, Dalek time machines are known as DARDISes. In the spin-off media, Gallifreyan Battle TARDISes have appeared in the comic books, novels and audio plays, which fire "time torpedoes" that freeze the target in time. The renegade Time Lady Iris Wildthyme's own TARDIS was disguised as a No. 22 London Bus, but was slightly smaller on the inside than it is on the outside. The Eighth Doctor Adventures novels have stated that future model Type 102 TARDISes will be fully sentient, and able to take on humanoid form The Eighth Doctor's companion Compassion was the first Type 102 TARDIS, and she was seen to have enough firepower to annihilate other TARDISes. Compassion and other humanoid time-ships appear in the Faction Paradox spin-off material. The "unofficial" Ninth Doctor from the 40th anniversary animated webcast Scream of the Shalka had a TARDIS console room that looked similar to the Eighth Doctor's version. In the Big Finish audio play The One Doctor, confidence trickster Banto Zame impersonated the Doctor. However, due to incomplete information, his copy of the TARDIS (a short range transporter) was called a "Stardis", resembled a portaloo rather than a police box, and was not dimensionally transcendental. In Unregenerate!, the Seventh Doctor and Mel stopped a secret Time Lord project to download TARDIS minds into bodies of various alien species. This would have created living TARDIS pilots loyal to the Time Lords and ensuring that they would have ultimate control over any use of time travel technology by other races. Those created before the project was shut down departed on their own to explore the universe. Since the destruction of Gallifrey and the Time Lords shown in the 2005 series, the Doctor believes that his TARDIS is the last in the universe. The removal of Gallifrey — and by implication the Eye of Harmony — may also be why the TARDIS in "Boom Town" needed to refuel using radiation from a space-time rift. In "Rise of the Cybermen" the Doctor states that the TARDIS draws power from "the universe", but is unable to do so while in an alternate reality. The 28 October 2006 Radio Times, in an image of the Torchwood Three headquarters, identified a piece of large coral on Captain Jack Harkness's desk as the beginnings of a TARDIS. John Barrowman, who plays Jack, said that "Jack's growing a TARDIS... It's probably been there for 30 years. I suppose in 500 years he'll be able to begin the carving process". In the 2008 Christmas Special edition, The Next Doctor, Jackson Lake (David Morrissey), while under the delusion that he is the Doctor, has a blue gas balloon which he identifies as his TARDIS, which he explains stands for "Tethered Aerial Release Developed In Style". It is not capable of time travel. In a deleted scene from the series 4 finale Journey's End, the Doctor gave a piece of the TARDIS to the half-human Doctor clone so that the latter could grow his own. When the clone remarked that growing a TARDIS would take hundreds of years, Donna Noble provided him with a method of speeding up the process. In "The Lodger" a vessel which the Doctor identifies as a prototype TARDIS[clarification needed] lures in unsuspecting people to pilot its controls, all of whom die due to humans being incompatible with the process. The same interior was used by the Silence in "Day of the Moon", but the intended connections between the two are still mostly unknown. In "The Doctor's Wife", the doctor has to build himself a TARDIS to be able to save Rory and Amy from inside his current TARDIS. 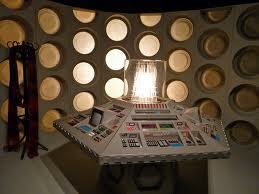 The console used for this episode was designed by the winner of a Blue Peter competition in 2010. Other appearancesSpin-offsThe sound of the Doctor's TARDIS featured in the final scene of the Torchwood episode "End of Days". As Torchwood Three's hub is situated at a rift of temporal energy, the Doctor often appears on the plass directly above it in order to recharge the TARDIS. In the episode, Jack Harkness hears the tell-tale sound of the engines, smiles and afterwards is nowhere to be found; the scene picks up in the cold open of the Doctor Who episode "Utopia" in which Jack runs to and holds onto the TARDIS just before it disappears. Former and recurring companion, Sarah Jane Smith, has a diagram of the TARDIS in her attic, as shown in The Sarah Jane Adventuresepisode "Invasion of the Bane". In the episode "The Temptation of Sarah Jane Smith", Sarah Jane becomes trapped in 1951 and briefly mistakes an actual police public call box for the Doctor's TARDIS (the moment is even heralded by the Doctor's musical cue, frequently used in the revived series). It makes a full appearance in "The Wedding of Sarah Jane Smith", in which the Doctor briefly welcomes Sarah Jane's three adolescent companions into the control room. It then serves as a backdrop for the farewell scene between Sarah Jane and the Tenth Doctor, which echoed nearly word-for-word her final exchange with the Fourth Doctor aboard the TARDIS in 1976. During the Eleventh Doctor era it reappears in "Death of the Doctor", is stolen by the Shansheeth who try to use it as an immortality machine, and transports Sarah Jane, Jo Grant and three adolescent companions. 1: 1st doctor's TARDIS. 2: 5th and 6th Doctor's TARDIS. 3: 8th doctor's TARDIS. 4: 9th and 10th doctor's TARDIS. 5: Time Wardrobe. 6: The Rani's TARDIS. 7: Secondary Control Room. 8: 4th Doctor's TARDIS. 9: 11th Doctor's TARDIS. 10: 3rd Doctor's TARDIS. 11: The Master's TARDIS.